Available in sizes 1/4” to 17” wide in any length. Wide belts, paper and cloth available in sizes 18” to 57” wide in any length. Multiple splice belts available in all width and lengths. Standard oscillating sander sheets available in all standard and non-standard dimensions; finishing paper, cabinet paper, waterproof, emery, garnet and glass - all available in 9” x 11” as well. All sizes available in paper and cloth with center hole or without, in PSA or CARBOFIX backing. Fiber discs available in 3” to 9-1/8” diameter with 5/8” or 7/8” enter hole. Available in paper and cloth backings, PSA or CARBOFIX in 1/2” to 57” width in standard lengths of 50 to 100 meters; economy rolls are also available in glue bond 1/2” to 3” wide in 50 meter lengths. All specialties available: spiral wound bands and sleeves, cross pads, no lap bands, cartridge rolls (straight and tapered), tapered cones, quick change discs and holders, overlap discs, slotted discs, back up pads both CARBOFIX and PSA. Flap wheels mounted 1” to 3” diameter, 5/8” to 2” wide, unmounted flap wheels from 3-1/2” to 12” diameter, 1” to 2” wide. 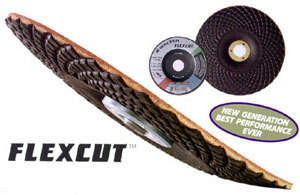 Flex Cut, the leading flexible grinding wheel for the last 25 years, has been re-designed and re-formulated to meet the challenges of the new century in the metal fabricating industry. Its new and unique diamond cut surface pattern delivers superior performance on all ferrous and non-ferrous metals. And its new construction allows mounting like a grinding wheel-no backing pad required! Of course, its many long appriciated characteristics-like exceptional control and operator comfort-have been retained and new ones have been added to set it even further apart as the leader in its class. Formulated for use on all ferrous metals like steel, stainless steel, exotic alloys and cast iron. Superior performance on all heat sensitive metals like aluminum and other non-ferrous metals. Can also be used on fiber-glass, concrete and all othe building materials.